Our goal for COMMON SENSE; Revisited is to create a paradigm shift towards freedom, as Thomas Paine's original COMMON SENSE did in 1776. To do this, we need your help to distribute the COMMON SENSE; Revisited Audio CD/MP3. Click below to listen to a sample chapter of the audio CD. I am so happy that you made an audio book out of Common Sense Revisited. I am working almost non-stop it seems. The audio book provides a great resource for me to be able to obtain great information while on the go. Common Sense; Revisited presents the ideals of individual liberty and freedom in a way that is easy to understand at all levels. I will definitely be encouraging others to read or listen to this document. Thank you for the hard work you put in to educating the minds of the people about the fundamental principles on which this country was established. 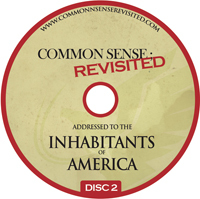 The narration for the Common Sense Revisited audiobook is outstanding! It is clear and pleasant, allowing the resounding words of the book speak its own volumes, which it did very well I might add. This is a great option for the hard working American who may only have time to listen to the audiobook on CD in their car or on their iPod while busy. I'll take the positive, productive tones of Common Sense Revisited on audiobook over talk radio any day. I pray that the wisdom found in this book and in our Constitution never gets washed down by the suppression of socialism. My husband was all fired up about these CDs, he wanted to listen to them in the car on our way to get breakfast on Sunday. I was like, yeah, whatever. Then we started listening and I was riveted. I found myself nodding and saying, "Yes, that's true." It was a revelation. To have put into words what I've thought was wrong with our country, but also to elucidate things I hadn't even considered but knew to be true the minute I heard them, is amazing. I'm not always an activist, but this kind of concise illumination of how we are being fleeced, bit by bit, and why we need to wake up and smell the coffee, shook me to my core. These are principles around which I can rally. This makes sense to me...Common Sense...and it's high time we got a gigantic dose of it in our country and in our government. I pray that this starts a grassroots movement that shakes the very foundations of government and puts it all back in the hands of We the People, where it belongs. Thank you for a great eye-opener, I am going to share this with all my patriotic friends.